Catching website’s Static content temporary to load quickly, reduce server load bandwidth, and server response. caching all js files into one place and serving them from only one. increase page load time and decrease requests and DNS lookups. WP super cache: created and maintained by wordpress team but not so impressive. W3 total cache: Advance caching plugin available in free and Premium version. Autoptimize: simple and best there are lot of plugins available in wordpress plugins directory. Automatically caches the pages and stores at cloud servers from there reduce all the cpu load. rather than local disk. Free SSL Shared for lifetime. Prevent lots badbots based on security rules. Why we have to install cloudflare plugin? since our DNS severed from the cloudflare. 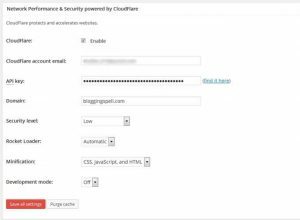 How cloudflare wordpress plugin helpful? Plugin tracks the website update to cache automatically, (HTML caching not available with cloudflare clearing cache when Updating a new post not necessary). is cache plugins works with Varnish? Varnish redirects users to static html pages in peak time. available for apache all servers. you can check varnish working status many online tools http://www.isvarnishworking.com/. do a page test on gtmetrix and look for waterfall report to see which file script loaded in seconds. Cloudflare shared ssl causing high response time 200ms is the acceptable response time 2 seconds is the ideal page load time. Minification of jJS,HTML, CSS: Both cloudflare & W3tc Minify the static content. Enable Auto Minify in cloudflare speed>> auto minify CSS,jS, HTML (Not available in plugin). Database cache: enabled by disk method on w3tc helps to reduce server response. it caches db posts load from the local cache directory. Other Best CDN for wordpress , AMP pages.